Here's my May column for AVENUE magazine. Photography this month is by Leah McCullough. In June 2003, smartphones and tablet computers had not yet been invented. Windows XP was the dominant operating system and the idea that anything could possibly come along to challenge that was, frankly, laughable (Microsoft are still laughing at the very notion ten years later, only in a more hysterical manner). Facebook was a full half year away and Twitter not yet even a twinkling in its creator’s eye. iTunes hadn’t yet been released for the PC. VHS cassettes could still be bought in shops. Finding Nemo was educating movie-goers on the important issue of the anthropomorphism of fish and Beyoncé Knowles was topping the pop charts with ‘Crazy in Love’. Ok, so technically it started before that, depending on where you set your marker: October 2002, if you start counting from the opening of the public beta; March 2002 if you stand by the date that the first resident, Steller Sunshine (now over eleven years old), joined the private beta. Incidentally, Stellar’s giant beanstalk – her first SL creation – can still be found at http://slurl.com/secondlife/Welsh/24/79/21 if you fancy a bit of metaverse archaeology. But June 2003 is the date that Linden have set as SL’s birthday, which means that SL is officially ten years old next month. No mean feat at all for a software product. It’s come a long way during that time and many aspects of it must now appear almost unrecognisable to those very first residents, who had no mesh (not even sculpties), no voice, no windlight, no monetary system and no ability to teleport. That’s right: SL in its first official incarnation had no teleporting, and when it was introduced it was only through a hub to hub system, where you had to make your own way across regions to and from the nearest teleport station. In ten years, we’ve seen SL grow into a major phenomenon, talked about by the media and attracting large numbers of registrations every day, only to dwindle slowly into the (hopefully temporary) internet obscurity of continuing but no longer fashionable services. We’ve seen RL businesses and universities leap head first into the metaverse, only to depart within a couple of years, the promised potential of 3D Internet apparently unfulfilled. And we’ve seen Linden itself turn from an energetic company focused on education, open communication and user creativity into a much more opaque organisation seemingly concerned mainly with the commercial markets available to it and a more heavy-handed regulation of the metaverse (though not always without good reason). But, despite all this change and turbulence, is the essence of SL now really so different from how it was back then? I say that it’s not. 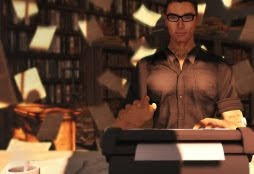 Whilst there have been many technical improvements over the years, most of us still communicate primarily in text and the graphics upgrades have probably only served to enhance rather than create the sense of immersion we feel in the metaverse. RL businesses opening up in SL – for example, car manufacturers offering prim versions of their latest RL hatchbacks (let’s be honest here, the proper word for this was ‘advertising’) – always was a red herring of no real consequence to the vast majority of residents; probably few of us even realised that they’d left until we read about it in a doomsayer blog post somewhere. And, whilst the ‘feel from above’ has undeniably cooled from the jollier days during such years as 2006 and 2007, I just can’t believe that the average resident’s level of affection for Linden is so significant to their day-to-day enjoyment of the metaverse that they consider the whole thing qualitatively ruined now. For sure, we all grumble about lag and sim crashes, but I’ve yet to hear anyone tell me they’re leaving SL because they just can’t handle the failed teleports any more. If anything, the day-to-day technical issues of SL have just taught us to be tolerant. No-one ever seems to mind when we disappear halfway through a conversation because we’ve all had exactly the same experience at some point or another. And, at the end of the day, SL crashing is pretty far down on the list of the worst things that can happen to you in life – second or otherwise. When I first entered SL (in 2006), it was mainly as a work-avoidance strategy. I will admit also to having been curious about how any sort of online world could be quite so engrossing that people would spend anything like the hours in them I’d heard reported, but it was hardly a curiosity that required urgent and immediate sating – until the task of writing my first novel in ten years came along, that is. It was with a fairly sceptical mind-set, then, that I first came to the metaverse, not expecting it in any way to exceed my somewhat limited expectations. And, to begin with, it didn’t even meet them. I had imagined that, at the very least, SL would be as smooth and as visually stunning as some of the first person computer games I’d seen advertised, and that this was presumably how it had achieved its following. I didn’t think for one moment that my avatar would look quite so primitive as it did and that everything would be quite so, well, jerky. In those days, initial orientation took place at Orientation Island (a copy of which exists at http://maps.secondlife.com/secondlife/Orientation Island Public/128/128/2) and further help was then available at Help Island (a copy of which exists at http://maps.secondlife.com/secondlife/Help Island Public/128/128/2). As visually unimpressive as those places were, things did at least work there as they’d been designed to (it helped that numbers per island were restricted and that no-one in either of those places had yet had opportunity to learn about or acquire wearable scripted things). But then I discovered the mainland and got my very first introduction to lag. The region I got sent to was massively overcrowded and my avatar seemed to be unable to do anything other than walk on the spot. Also, the screen seemed to be spewing text endlessly from local chat and I had no idea how one was supposed to keep up with it (in those innocent first few SL days I imagined myself to be a great deal more noticeable than I actually was, and believed that somewhere in that soup of text was at least a line or two addressed to me). Within about five minutes, I experienced my first viewer crash. The whole thing was hopelessly confusing and I persisted only because I still thought there had to be something to this that I was missing. It’s hard now to remember the exact ‘moment of immersion’. Making my first SL friend was certainly a big part of that. Learning the basics of building was another. The deeper and deeper I got, the more and more it felt like I’d discovered a whole new dimension to life that had previously been hiding in the shadows. SL started to change the way I thought about RL, but the way in which this was true was itself something that changed over time. Imagine a Venn diagram with two circles, one labelled ‘RL’ and the other ‘SL’. When sceptics like I was first enter the metaverse, the two circles are completely separate: what could there possibly be in a ‘computer game’ that is of relevance to the real world? Then the two circles touch. Then they start to overlap. Finally ‘SL’ is just a smaller circle inside an enlarged ‘RL’, and the ‘S’ and ‘R’ prefixes are increasingly meaningless. There is only ‘Life’; there is only that which is experienced, be it physical or virtual or otherwise. Because all experience is ultimately mental experience. The first things we learn from SL might be how to use the interface and then how to make things happen in the shared creative space (as Linden now view it), but what we go on to learn can end up touching upon some of the most fundamental issues concerning human experience. How do we think about and identify with ourselves? How do we connect with others? What constitutes a place? What constitutes engagement in meaningful activity? The personal growth that SL offers us in these areas is applicable to our whole lives, not just our virtual ones. To give just a small and (literally) concrete example, creating buildings in SL has motivated me to study post-war architecture, which has enhanced enormously my enjoyment of building design in the physical world. Appreciation of that which we already have surrounding us is much touted these days as a key to long-lasting happiness: how ironic that one route to improving this should be through a virtual world where it’s possible to create and explore the things you don’t already have. 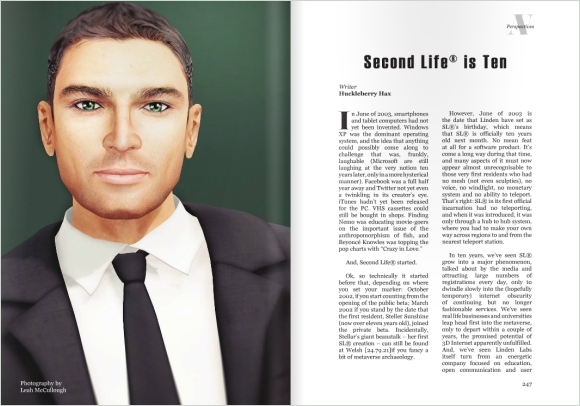 Happy birthday, Second Life. You started something amazing. Here’s to the next ten years of metaversing.